A good weekend for the Malaguista 11-a-side teams, with victory for all except the reserves. In addition, the Infantil A were proclaimed league champions following a 0-3 away win against Granada CF. 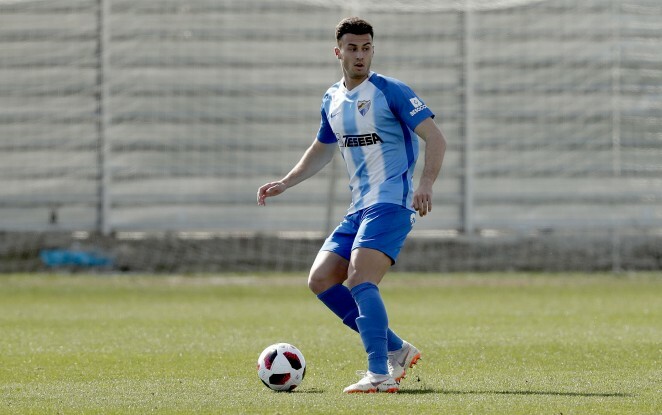 The Blue and Whites’ reserve team faced a tough match over the weekend against the team in second place in the standings, RC Recreativo de Huelva, and didn’t manage to claim any points. Manolo Sanlúcar’s boys stood up to the ‘Decano’ of Spanish football and had chances to take the lead, but the goals didn’t materialise. In minute 51 the visitors went ahead and from then on, the Blue and Whites sought an equaliser that never arrived. Francis Bravo’s team achieved a big away win against UD Almería by 1-3. A goal from Mike and a brace from Vicario led the Juvenil División de Honor to victory, with a total of 64 points, just two away from the team in third place, Real Betis. Atlético Malagueño are hosting CF Villanovense tomorrow, Saturday at the Federación Malagueña (18:00) on Second Division B Group IV matchday 34.